[S1] Ancestry.ca, online \Ancestry.ca\, Barton Family Tree. Hereinafter cited as Ancestry.ca. 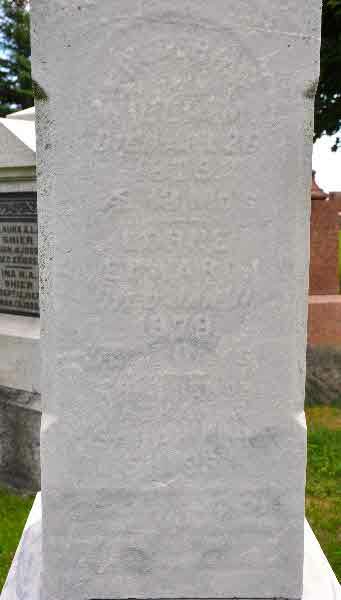 Burial* She was buried in Sunderland Cemetery, Brock Twp., Ontario County, Ontario, Canada. 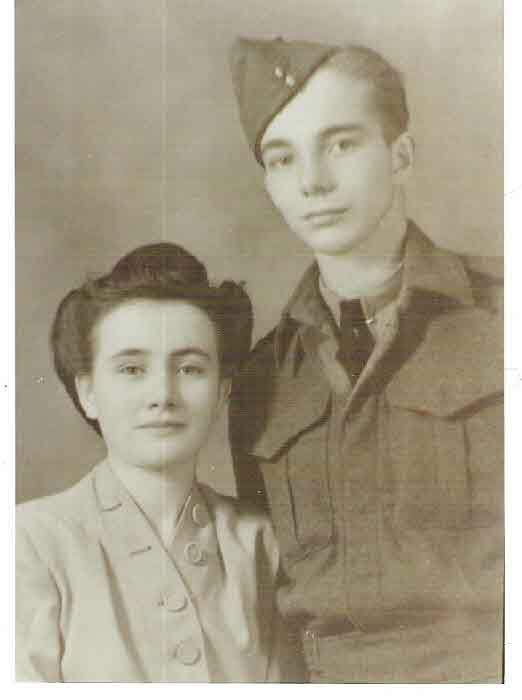 Fact 1* Photo of Linda Shier and her twin brother Carman Richard Shier before he went to Holland in WW2. Born in Newmarket, Ontario on September 13, 1925. Linda peacefully made her entrance into the presence of her Lord and Saviour Jesus Christ on Saturday, February 17, 2018 at the age of 92 while in residence at Arbour Heights Nursing Home, Kingston. 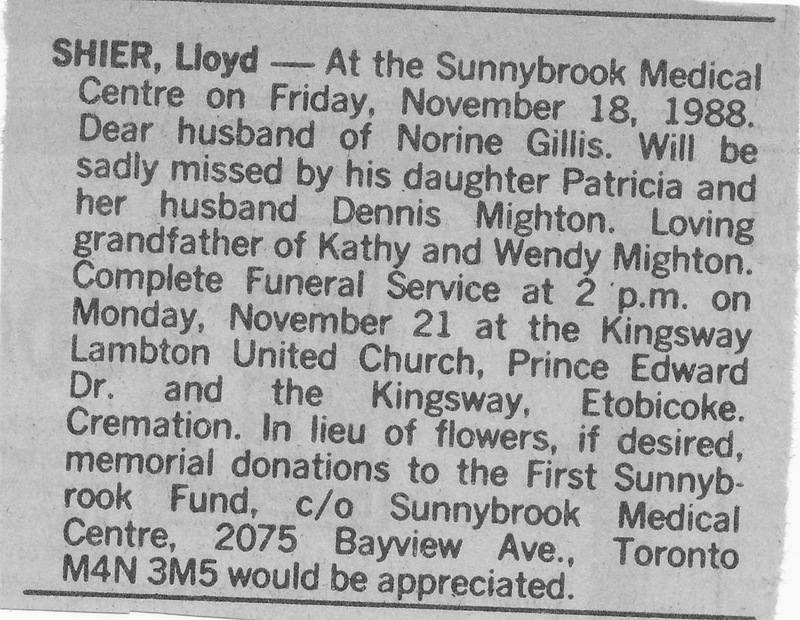 Linda lived most of her life in Kingston, Ontario, having also lived in Newmarket, Belleville, and Ajax. Loving mother of Myron Silver and Susan Shurrock, loving mother-in-law of Peter Shurrock, loving grandmother of Lisa Heney, Kathryne Silver, Laura Dawson and Matthew Silver. 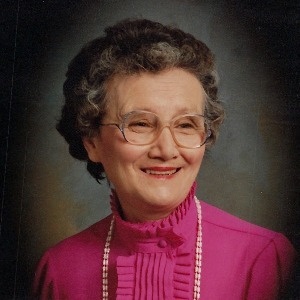 Daughter of John and Suzie Shier, and sister of Wesley Shier, Carmen Shier, Verna Williamson, June Lee, Trevor Shier and Gwen Brown. 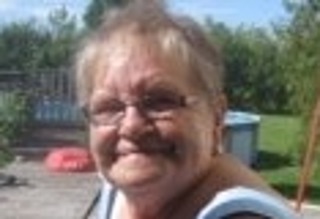 Survived by her sister Verna Williamson. Beloved by nieces and nephews. Fondly remembered by extended family and friends. The family will receive friends at the Township Chapel of the Gordon F. Tompkins Funeral Homes 435 Davis Drive (Centennial at Taylor – Kidd) on Friday, February 23, 2018 between the hours of 10 a.m. and 12 noon. A Graveside Service will be held at Cataraqui Cemetery, Sydenham Road on Friday, February 23, 2018 at 12:30 p.m. The Funeral Service will be held at Polson Park Free Methodist Church, 5 Miles Ave., Kingston on Friday, February 23, 2018 at 2:00 p.m. with refreshments following. Burial* He was buried in Eden Church Cemetery, Mariposa, Victoria County, Ontario, Canada. 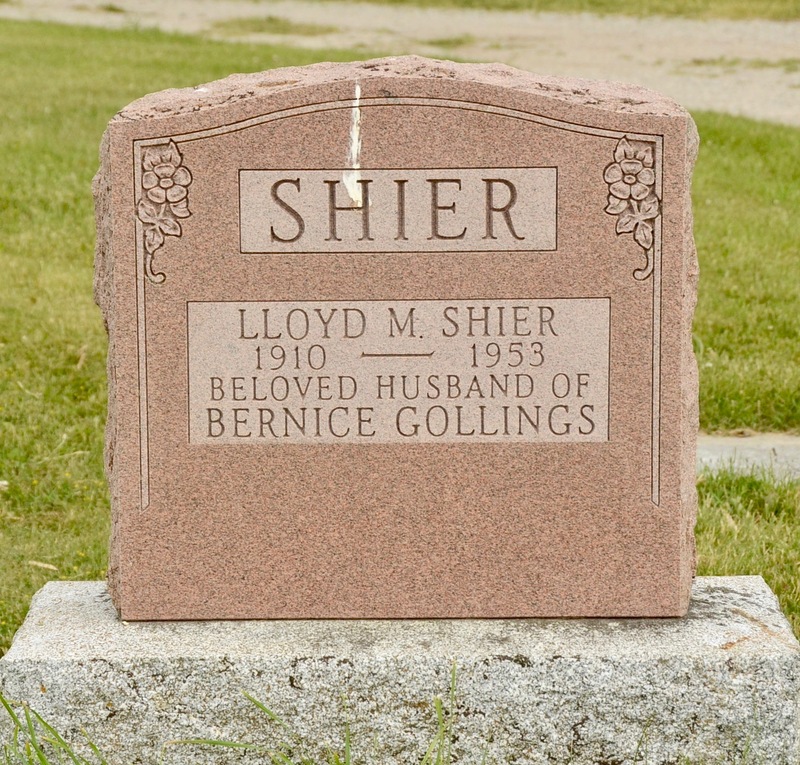 Death* Lloyd Mervyn Shier died on 29 August 1953 in Bryanston, Huron County, Ontario, Canada, at age 43; resulting from a heart attack. Lucan, August 30 - Lloyd M. Shier, 43, of Bryanston, died Saturday after suffering a heart attack. 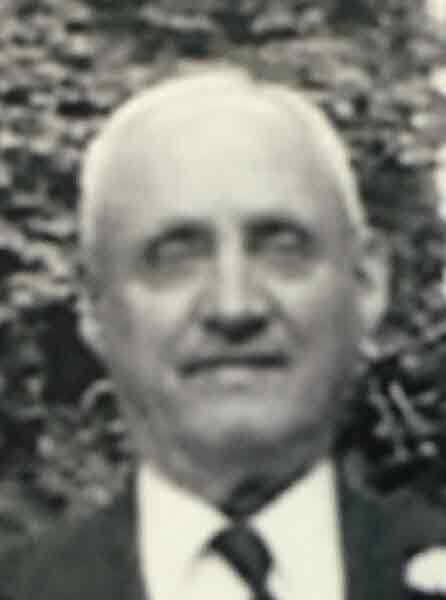 Mr. Shier ran a general stone in Bryanston for the past 20 years. 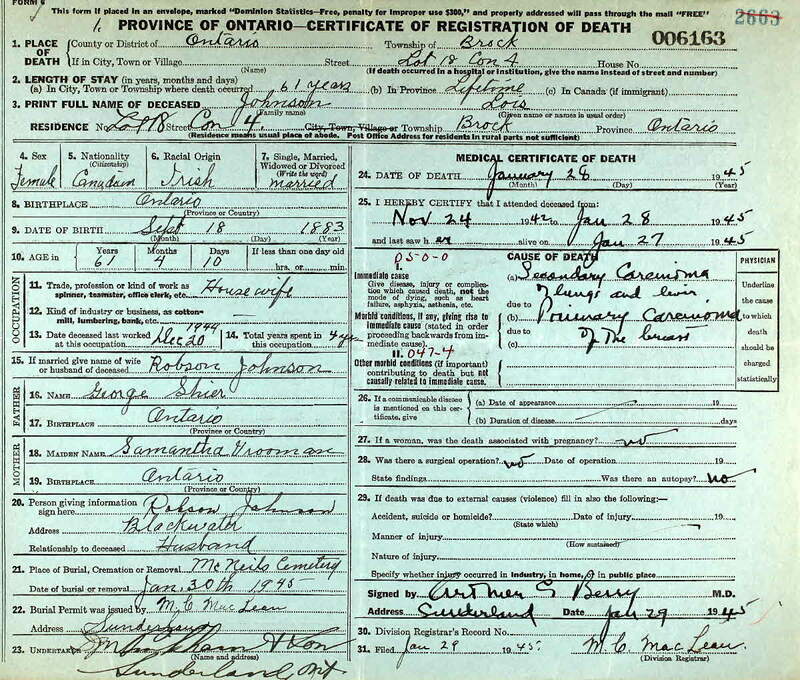 Burial* He was buried in Kirkton Union Cemetery, Usborne Twp., Huron County, Ontario, Canada. 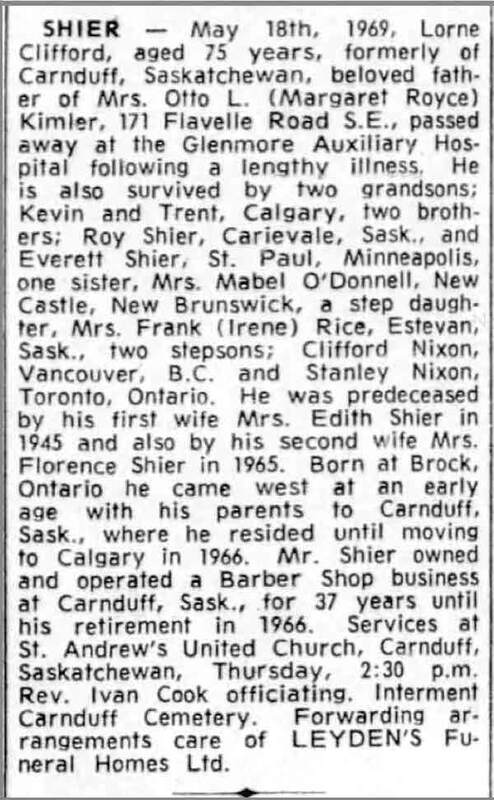 Death* Lloyd Phelan Shier died on 18 November 1988 in Toronto, York County, Ontario, Canada, at age 80. 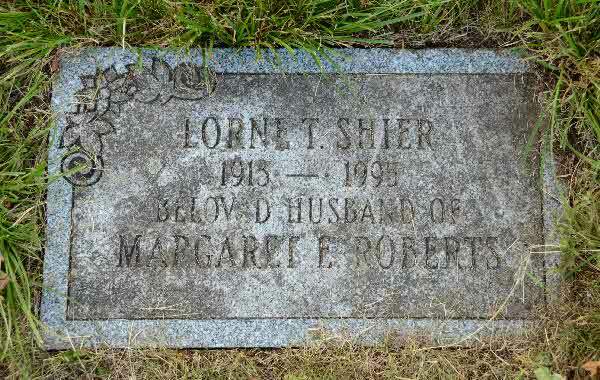 Birth* Loftus Edgar Shier was born on 1 May 1880 in Brock Twp., Ontario County, Ontario, Canada. 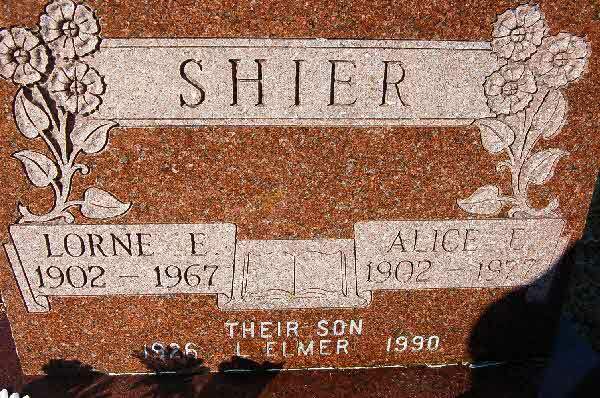 Death* Loftus Edgar Shier died on 2 October 1880 in Brock Twp., Ontario County, Ontario, Canada. Burial* He was buried in St John Cemetery, Brock Twp, Ontario County, Ontario, Canada. [S73] Ireland, Select Births and Baptisms, 1620 - 1911, online \, Birth Registration for Loftus Theophilus Shire. [S80] Ireland, Births and Baptisms, 1620 - 1911, online \, Baptism of Loftus Shire, son of Nicholas Shire and Ann on Mar 16, 1814. [S111] Dublin, Ireland, Probate Record and Marriage License INdex, 1270 - 1858, online \, Marriage of Loftus Theophilus Shire and Caroline Amelia Walker. 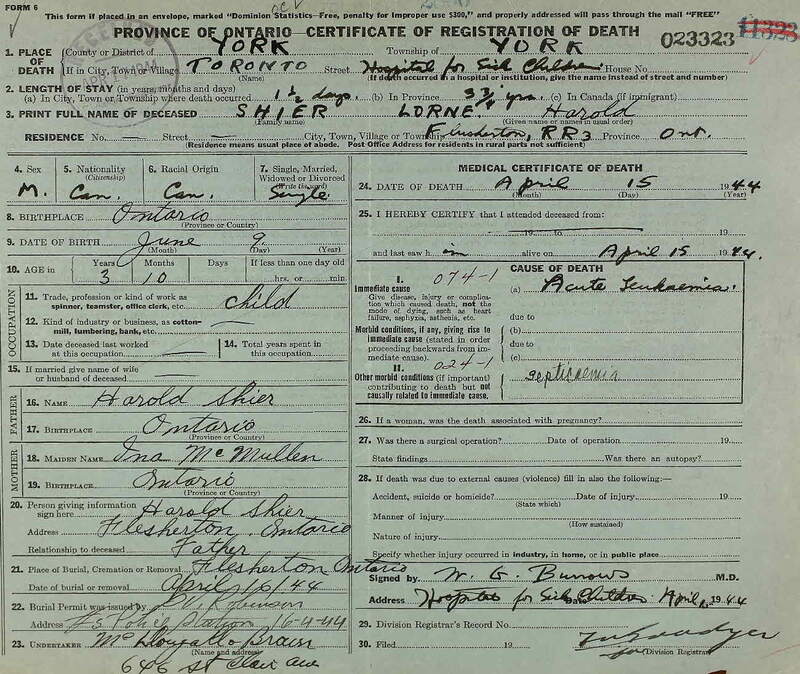 Birth* Lois Catherine Alma Victoria Shier was born on 18 September 1883 in Brock Twp., Lot 4 Conc 5, Ontario County, Ontario, Canada. 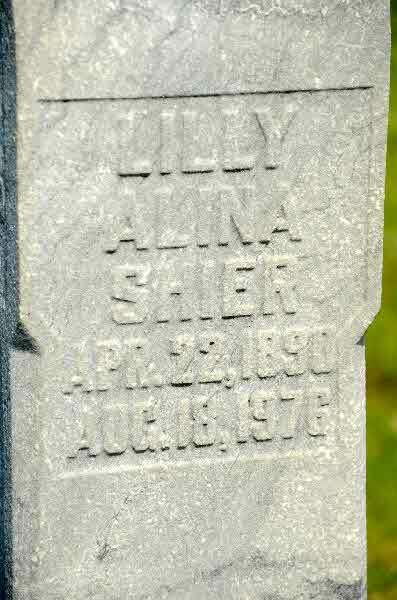 Death* Lois Catherine Alma Victoria Shier died on 28 January 1945 in Lot 18 Conc. 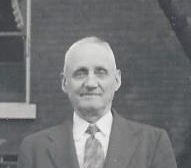 4, Brock Twp., Ontario County, Ontario, Canada, at age 61. 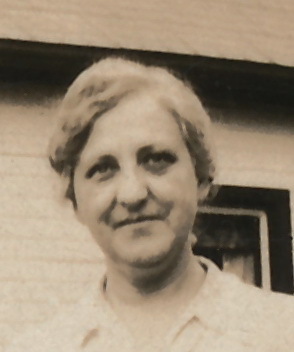 Burial* She was buried on 30 January 1945 in McNeil Cemetery, Brock Twp., Ontario County, Ontario, Canada. 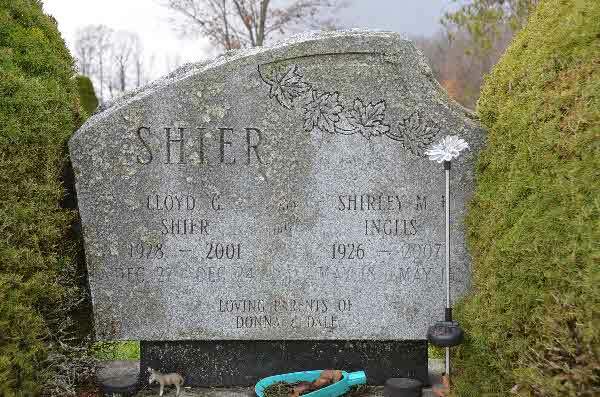 Death* Lorna Shier died on 23 December 2018 in County Limerick, Ireland; Shier (Prospect House, Foynes, Co. Limerick.) 23rd December 2018. 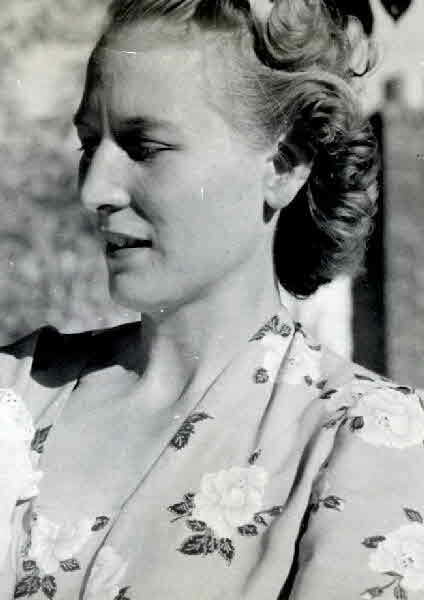 Lorna, elder daughter of the late Frederick and Vera, sister of Richard (deceased), Freda, Philip and Christopher. will be in Embury Close, Adare on Saturday, 29th December, from 4.30pm to 5.30pm followed by removal to Ballingrane Methodist Church, arriving at 7pm with the family present until 8pm. 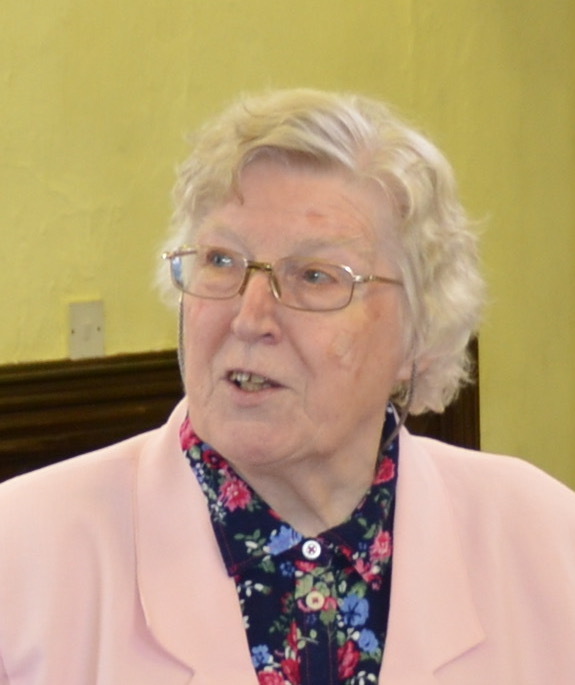 Service of Thanksgiving for her life on Sunday, 30th December, at 2pm. Burial afterwards in the adjoining graveyard.flowers please. Donations if desired to Milford Hospice.private. Fact 1 From Aflimerick.org Alliance française de Limerick is saddened to learn of the recent death of our past Présidente, Lorna Shier. 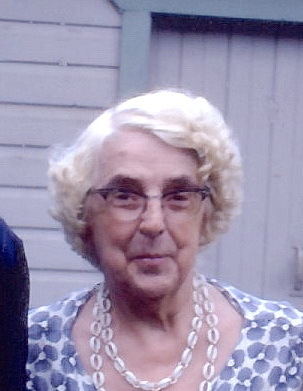 Lorna was president of Alliance française de Limerick from 1994 to 2013. She was a longtime franchophone, acquiring her fluency in French when she works as an au pair in France during the mid sixties. Having studied and worked there, she returned to Limerick in 1974 where she joined Alliance Française and attended classes, eventually obtaining the prestigious Diplome de Langue Française from Alliance Française Paris in 1992. Around this time, Lorna was asked to join the committee and she displayed a business sense and a strong work ethic that soon saw her elected as Présidente. During her time as Présidente, Lorna dedicated herself to the continued success of Alliance française in Limerick, she introduced the DELF/DALF exams and oversaw the relocation to the current site at 7 Pery Square. Whenever she could, Lorna travelled to France both for holidays and Alliance business as a committee member. She continued to support Alliance Française after her retirement and joined us to celebrate La Fete Nationale many times. 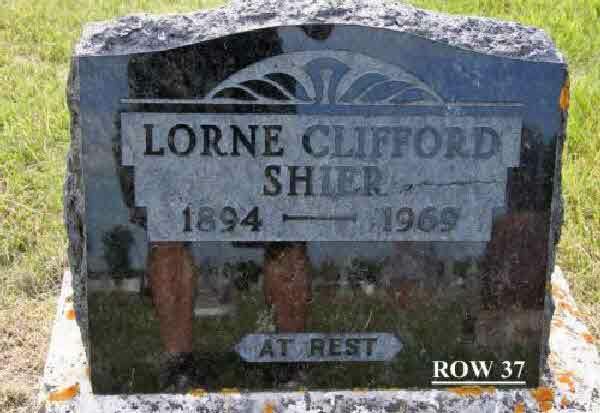 Death* Lorne Clifford Shier died on 18 May 1969 in Glenmore Auxilliary Hospital, Calgary, Alberta, Canada, at age 75. 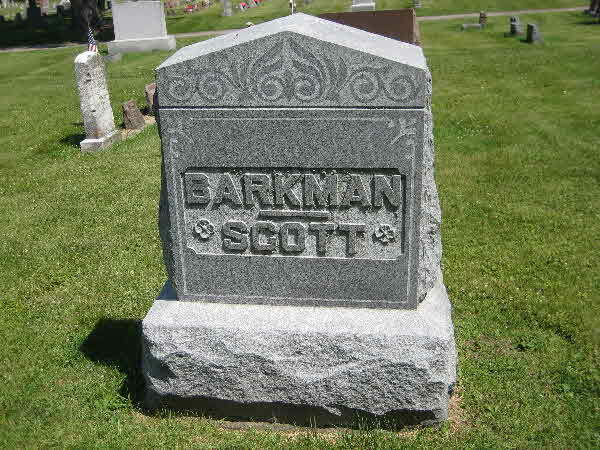 Burial* He was buried in Carnduff Cemetery, Carnduff, Saskatchewan, Canada. 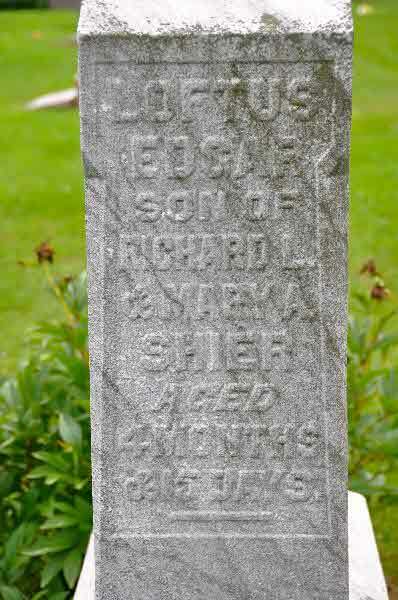 Death* Lorne Edward Shier died on 11 January 1880 in Brock Twp., Ontario County, Ontario, Canada. Burial* He was buried in St. John Cemetery, Brock Twp., Ontario County, Ontario, Canada. Burial* He was buried in Bethesda Cemetery, Scott Twp., Leaskdale, Ontario County, Ontario, Canada. 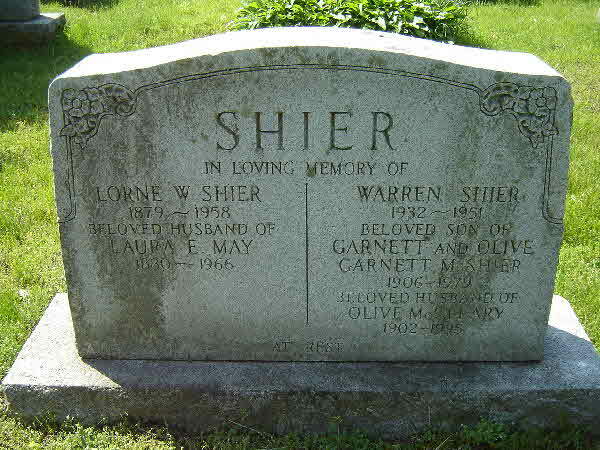 Death* Lorne Harold Shier died on 15 April 1944 in Hospital for Sick Children, Toronto, York County, Ontario, Canada, at age 3. Burial* He was buried in Flesherton Cemetery, Grey County, Ontario, Canada. Burial* He was buried in Bracebridge United Cemetery, Bracebridge, District of Muskoka, Ontario, Canada. 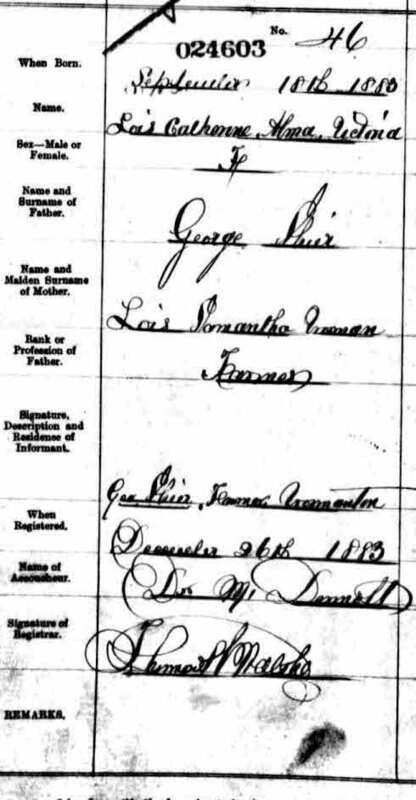 Marriage* Lorne Wesley Shier married Laura Ethel May, daughter of Thomas May and Susannah Rodman, on 27 June 1905 in Victoria County, Ontario, Canada. 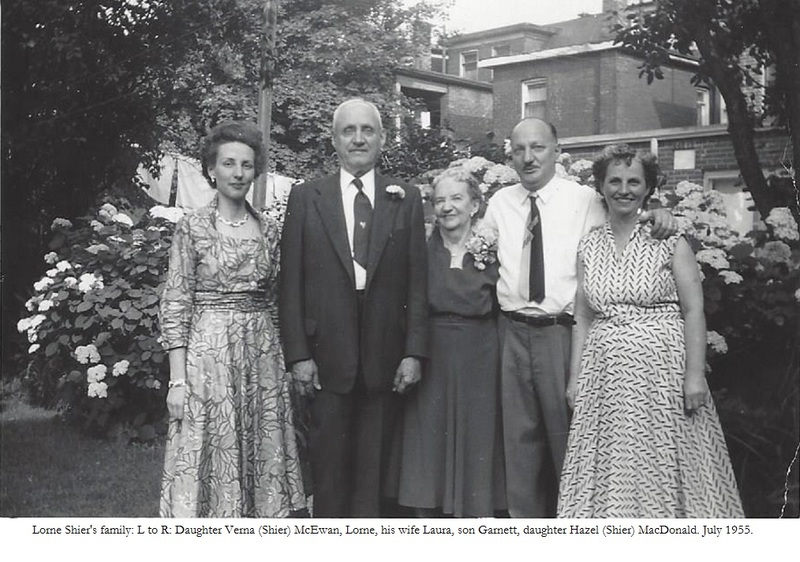 Fact 1 Photo of Lorne Wesley Shier, Laura Ethel May and their 3 children. 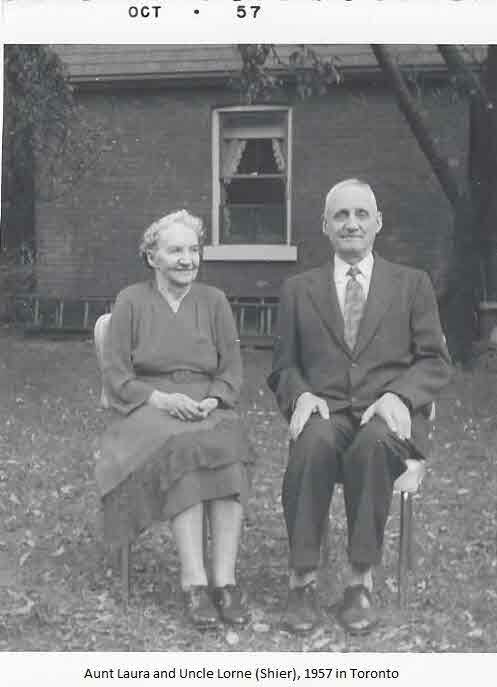 Fact 1* Photo of Lorne Wesley Shier and Laura Ethel May-Shier taken in Toronto in 1957. Burial* He was buried in Park Lawn Cemetery, Toronto, York County, Ontario, Canada. 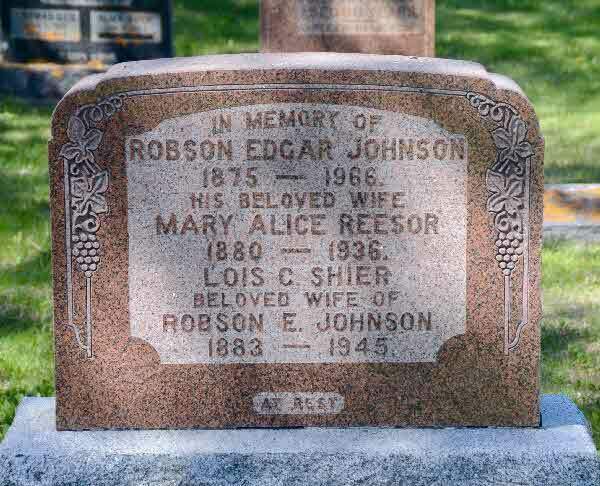 Burial* She was buried in Riverside Cemetery, Block 28, Oshkosh, Winnebago, Wisconsin, United States. [S104] Ireland, Seclect Marriages, 1619 - 1898, online \, Marriage of Richard Barkman and Louisa Shier. 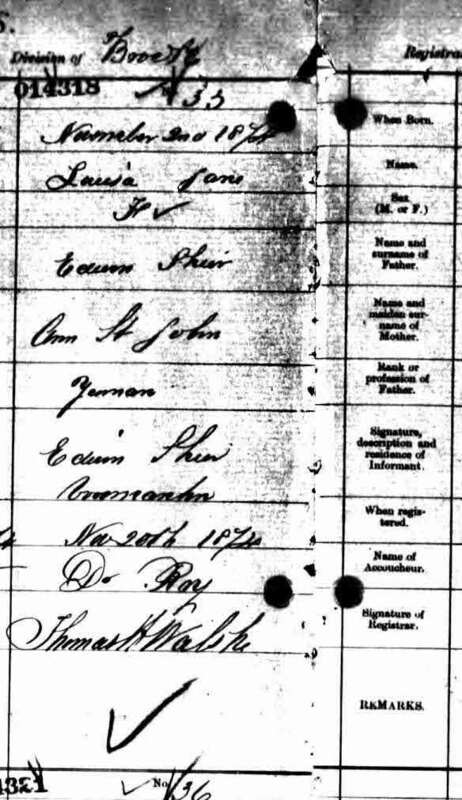 [S73] Ireland, Select Births and Baptisms, 1620 - 1911, online \, Birth Registration for Louisa Shire. 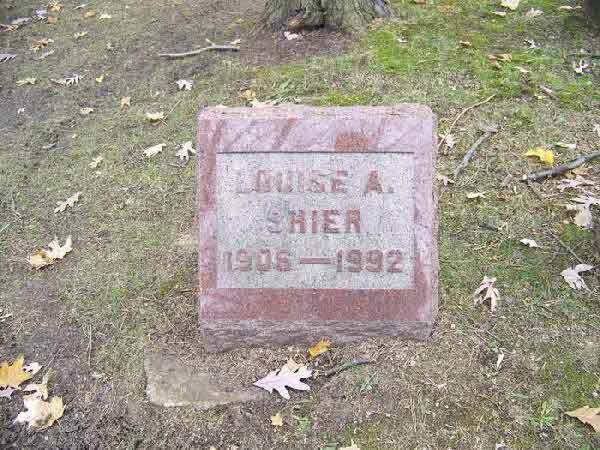 Birth* Louisa Jane Shier was born on 2 November 1874 in Brock Twp., Ontario County, Ontario, Canada. 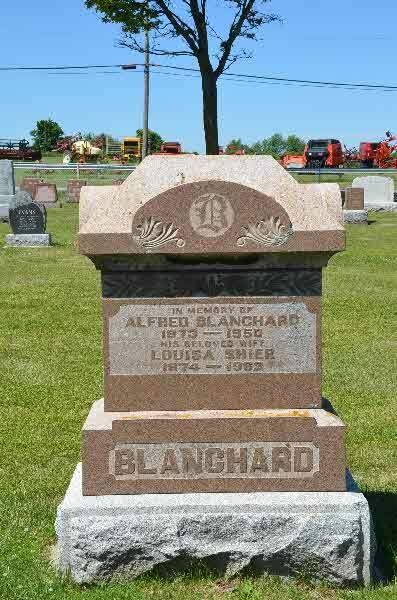 Marriage* Louisa Jane Shier married Alfred John Blanchard, son of Henry Blanchard and Martha Jane Hill, on 23 October 1907 in Brock Twp., Ontario County, Ontario, Canada. 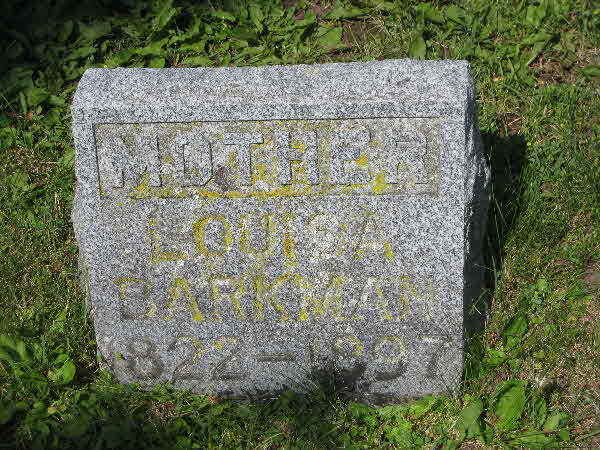 Burial* She was buried in Highland Cemetery, Ypsilanti, Washtenaw County, Michigan, United States. 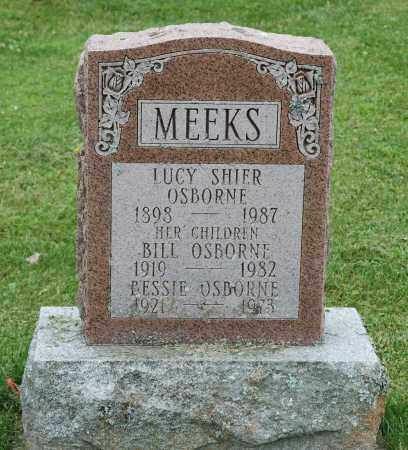 Death* Lucinda Shier died on 1 August 1922 in Thessalon, District of Algoma, Ontario, Canada, at age 88. [S30] Unknown record type: unknown subject, by unknown photographer; unknown series; unknown repository, unknown repository address. Online unknown url; unknown file name, Death registration for Luicnda Johnson. 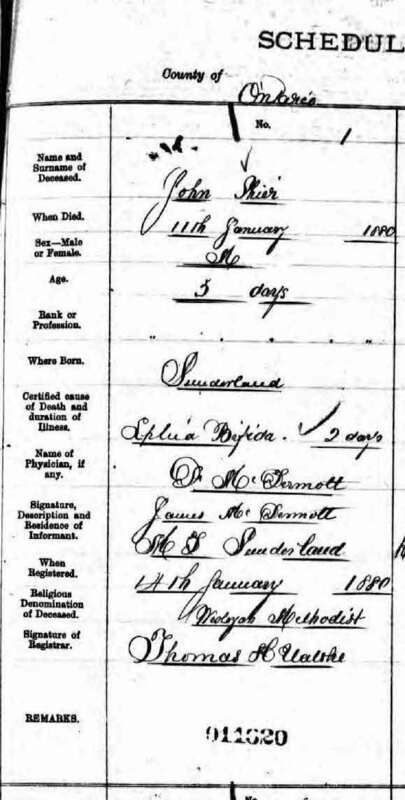 Marriage* Lucinda Shier married Marshall D. Burke, son of John Burke and Mary Thomas, on 23 December 1896 in Cooperville, Ottawa County, Michigan, United States. Burial* She was buried in Tamworth United Church Cemetery, Lennox and Addington County, Ontario, Canada. [S1] Ancestry.ca, online \Ancestry.ca\, Shelton Salmon Family Tree by Lindashelton11. Hereinafter cited as Ancestry.ca. 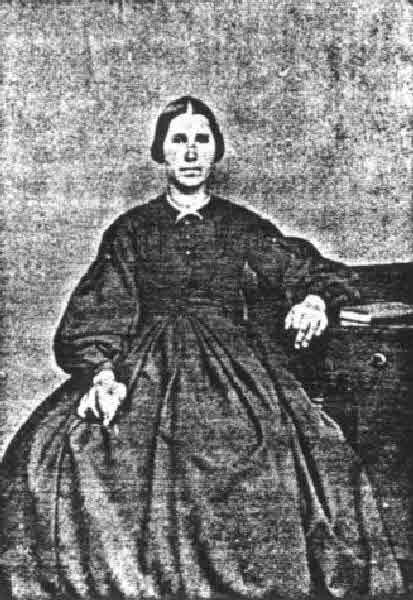 Marriage* Lucy C. Shier married James Porter on 13 April 1891 in Enterprise, Lennox and Addington County, Ontario, Canada. 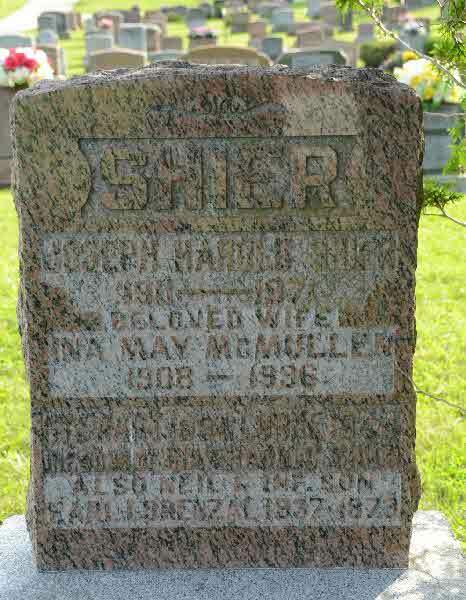 Death* Lucy C. Shier died on 19 June 1910 in Camden Twp., Lennox and Addington County, Ontario, Canada. 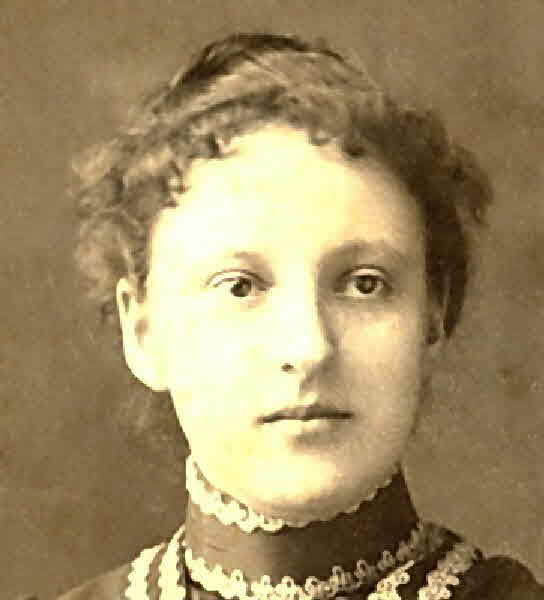 Marriage* Lucy Rebecca Shier married William Banks, son of William Banks and Elizabeth Holman, on 14 June 1899 in Toronto, York County, Ontario, Canada. 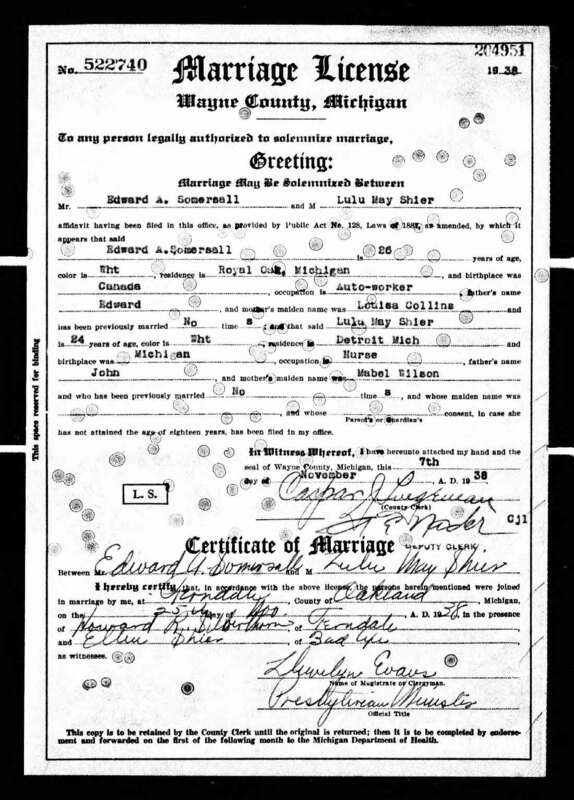 Marriage* She married Edward A. Somersall on 7 November 1938 in Ferndale, Oakland County, Michigan, United States.